Kaitlyn’s Foundation brings good cheer and exciting giving opportunities this holiday season. Kari Herer, an artist based in Portland, Maine, after learning about Kaitlyn’s Foundation in an article in the Fort Worth Star Telegram, reached out to Kaitlyn’s mother who allowed Kari to photograph Kaitlyn for an art workshop. The strength and patience of the caregivers and Kaitlyn’s sweet smile inspired Kari to create a print of Uno, Kaitlyn’s therapy horse. Fifty percent of the proceeds from the sale of Kari’s portrait of Uno go to Kaitlyn’s Foundation, helping to broaden the impact of the Foundation on other children who need physical therapy utilizing a horse as a tool. By chance, a buyer from Anthropologie, a boutique American retailer, strolled through Kari’s studio in Maine and discovered her Uno print. 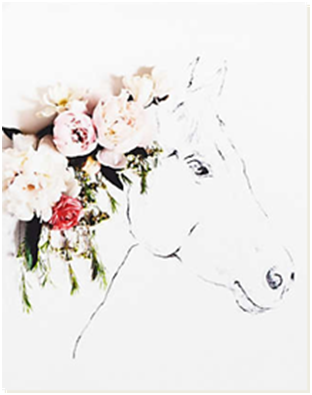 Anthropologie selected Uno’s portrait and two other Herer prints for their Winter and Spring internet campaigns. This is a fabulous opportunity to increase awareness for Kaitlyn’s Foundation and its cause, to raise funds and to cross items off your holiday giving lists! Help make this sale a huge success! Click on the portrait link to buy this delightful print for someone special in your life. Like or share this beautiful giving opportunity via Facebook or Twitter!